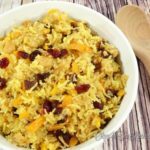 Pork Plov (Pork Rice Pilaf with Cranberries): rich in taste, marvelous dish to serve at any event. Our family version of pilaf. 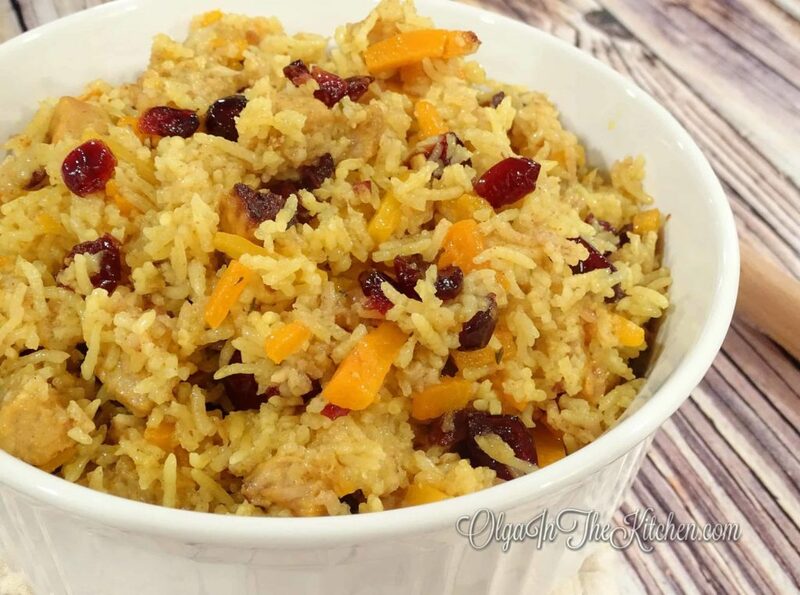 This pilaf recipe is so flavorful and extremely delicious; you just can’t get enough of it. There are probably thousands pilaf recipes all around the web, some with beef, some with chicken, even lamb, but I prefer mine with pork. The main idea of pilaf is to use rice, carrots, onions and meat and season with salt and pepper and other spices. Half of the time I make a simple version of rice pilaf in rice maker, and other times I put my time into this version. It’s slightly time consuming, but totally worth it. You can double the ingredients because this recipe re-heats nicely and can last days in the fridge. I even heard people freeze plov; no surprises there. This recipe is just that good! 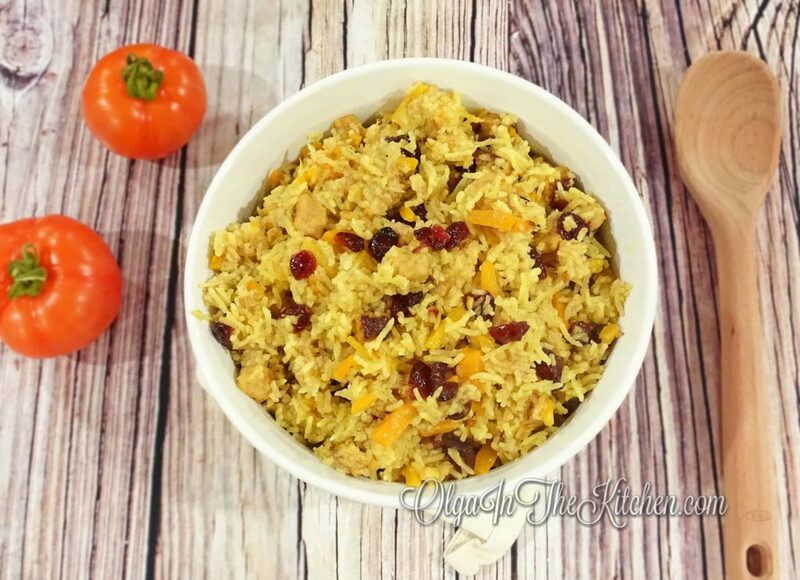 The addition of dried cranberries gives an extra sweetness and tang to this dish. 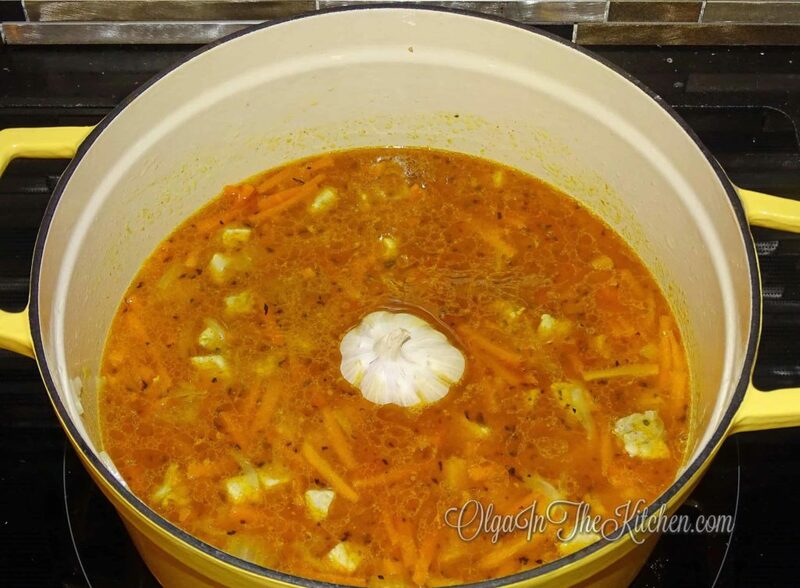 You’re going to need a cast iron casserole or something similar with a heavy lid to keep the steam from coming out. I got a Martha Stewart Cast Iron 6 Qt. Round Dutch Oven Casserole (in yellow 🙂 it was a present), extremely heavy and I love using it for so many dishes when it comes to sautéing. 1. Start by putting 1 cup uncooked basmati rice in a sifter; rinse in cold water and leave it in a bowl with cold water; set aside. Preheat 2/3 cup grapeseed oil in a cast iron casserole on low-medium heat for about 5 minutes. 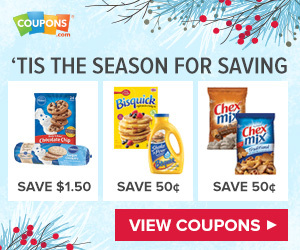 Meanwhile, prep and cut your main ingredients. 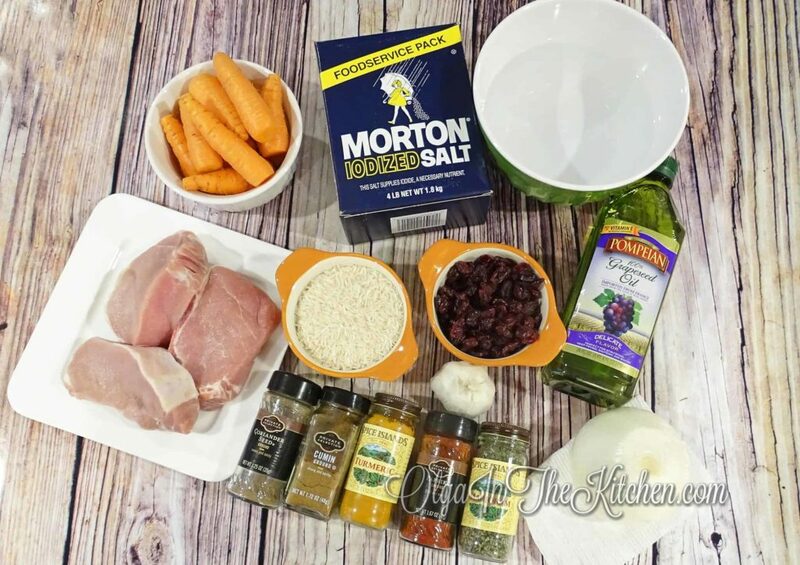 Cube 1.5 lb pork meat into 1/2” pieces or smaller, chop carrots into matchsticks (about 1.5” long, 1/4” thickness), and chop 1 large onion into similar pieces to carrots. 2. 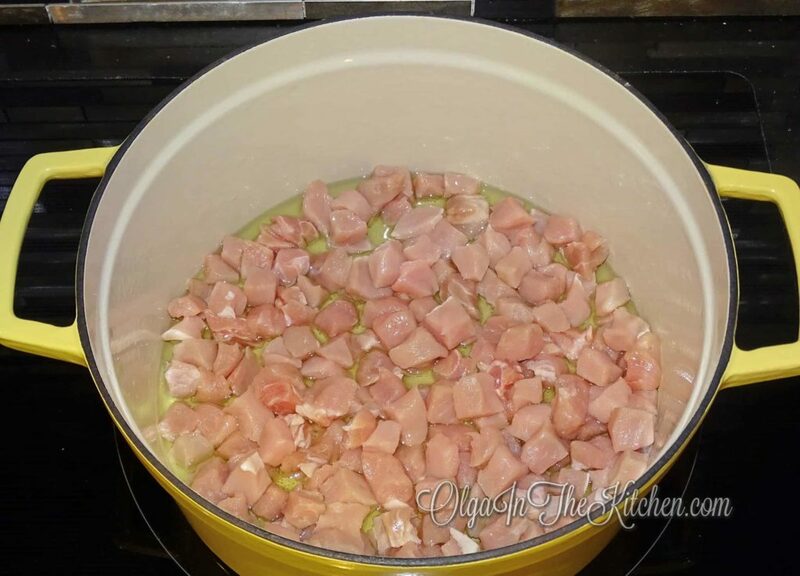 Add cubed meat pieces into heated oil, sauté for about 10-12 minutes, stir occasionally. 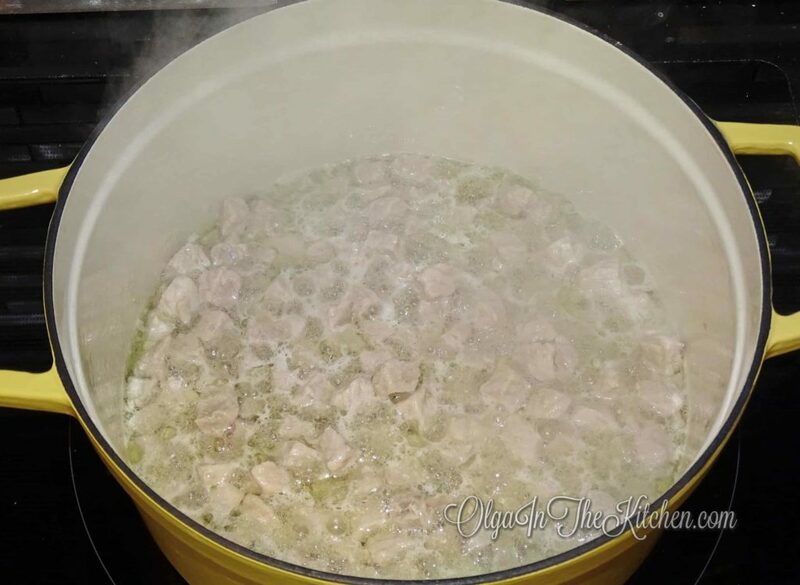 Add chopped onion to the meat, keep stirring occasionally for 10-12 minutes. 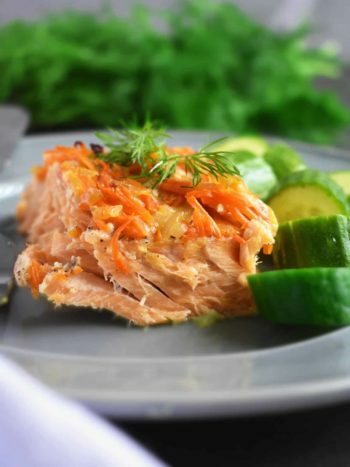 Add carrots matchsticks into casserole and keep sautéing for another 10-12 minutes. (Very important to stir occasionally to keep from scorching at the bottom). 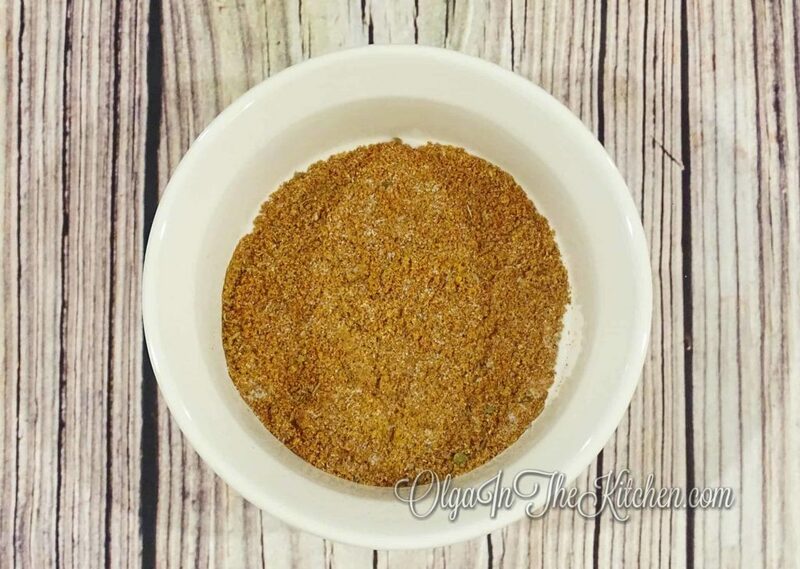 Meanwhile, measure herbs and spices: 1 1/2 tsp fine salt, 1 1/2 tsp ground cumin, 1/2 tsp ground turmeric, 1/2 tsp ground coriander, 1/2 tsp ground paprika, and 1/4 tsp dried paprika; whisk together and set aside. 3. Sprinkle mixed herbs/spices over sautéed ingredients, add in 2 3/4 boiled water, and lightly stir. (I have my water boiler that keeps hot water 24/7, but if you don’t have that, I would suggest boiling water in separate pot to have it ready). Cut off the head of the garlic to expose the cloves. 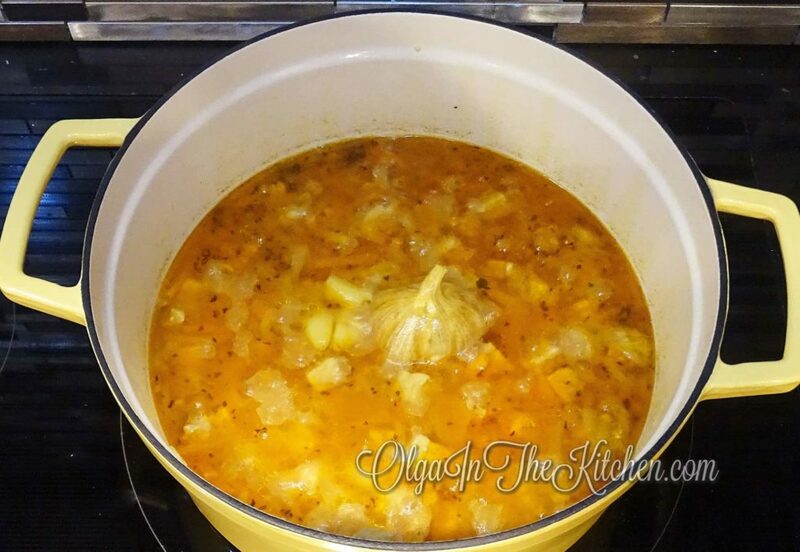 Put garlic cut side down into the center of the soup. You’re going to close the lid now, and keep it cooking for about 40 minutes on low; this is kind of a soup making process. (Make sure it boils a bit as I know every stove heating is different). 4. Remove garlic, make sure you get all the cloves. 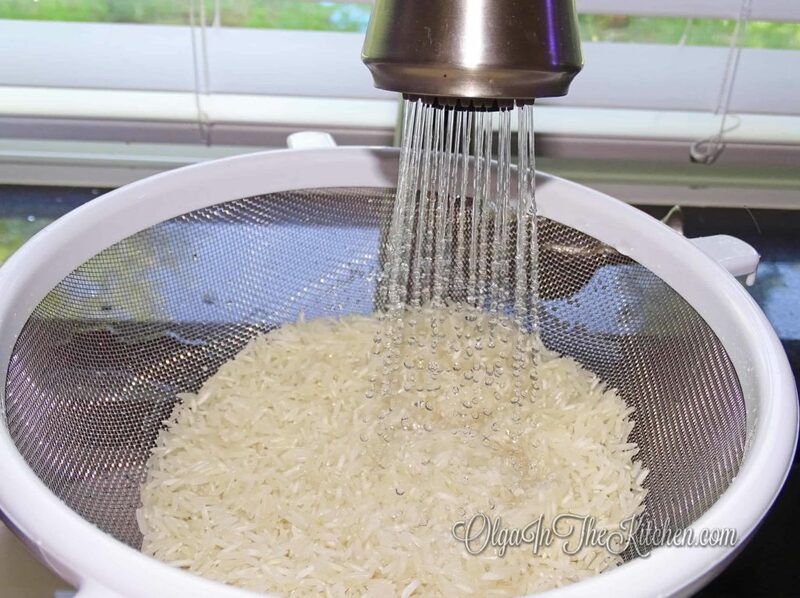 Rinse rice once more in cold water and spread on top in casserole. DON’T STIR IT, just spread on top to make sure all rice covered in the soup. Close the lid and turn up heat to low-medium (about 5). Saute for 15-17 minutes or until only about 3/4″ liquid left on the bottom when you put a spatula through. 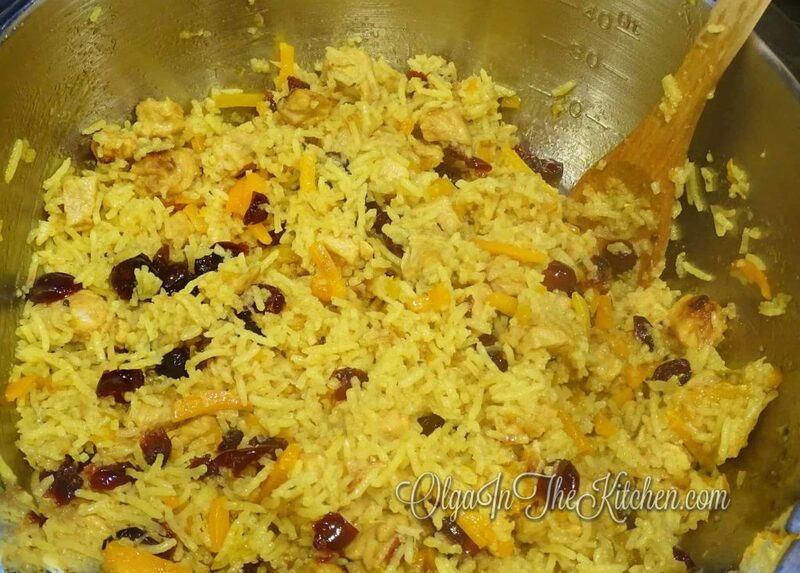 Sprinkle 1 cup dried cranberries over rice, and lightly push into rice, but don’t stir it. Close the lid back on, lower heat to low and let it saute for another 30-40 minutes until no liquid left. (Keep lid on the whole time so the steam stays in; you can check once-twice on the process). 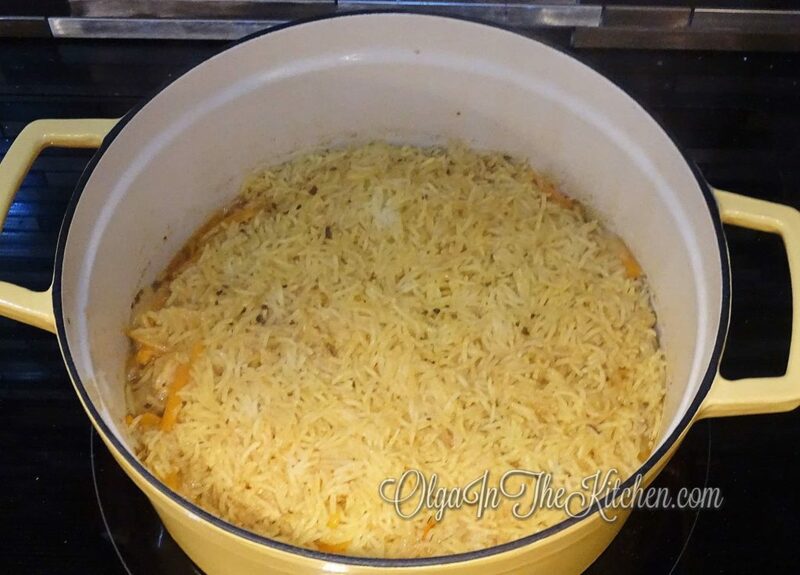 When finished, transfer cooked pilaf into a big pot or some metal big bowl. 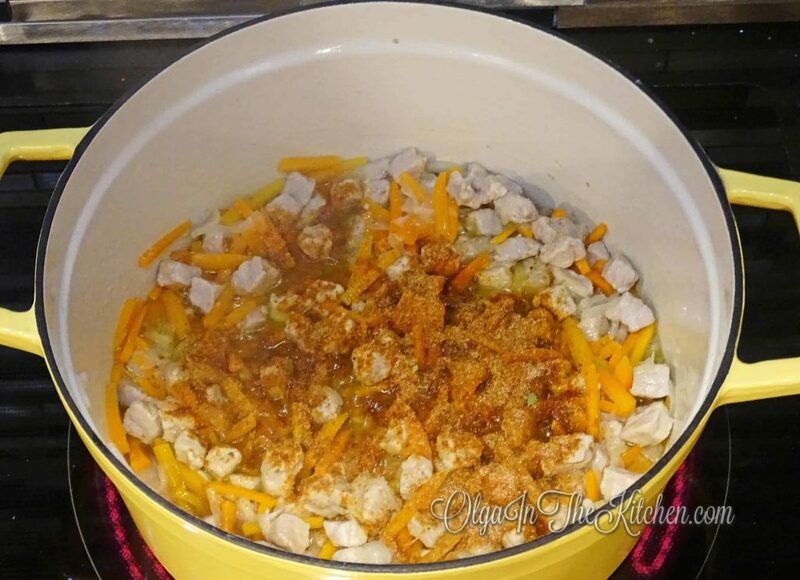 I would not suggest mixing in the casserole you cooked as there might be a bit scorching at the bottom (you don’t want that in your pilaf). Very gently mix everything with spatula. Try not to press or squeeze it. Store leftovers in refrigerator when cooled; heat on low the next day. But for now, serve while warm with tomatoes, cucumbers, pickles or any salad. Enjoy!!! 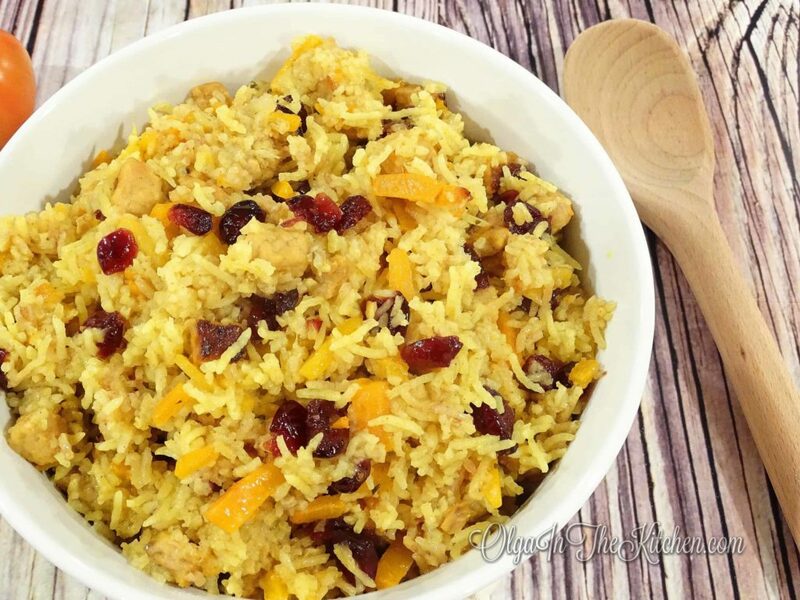 Pork Plov (Pork Rice Pilaf with Cranberries): flavorful, rich in taste, a delicious dish to serve at any event. 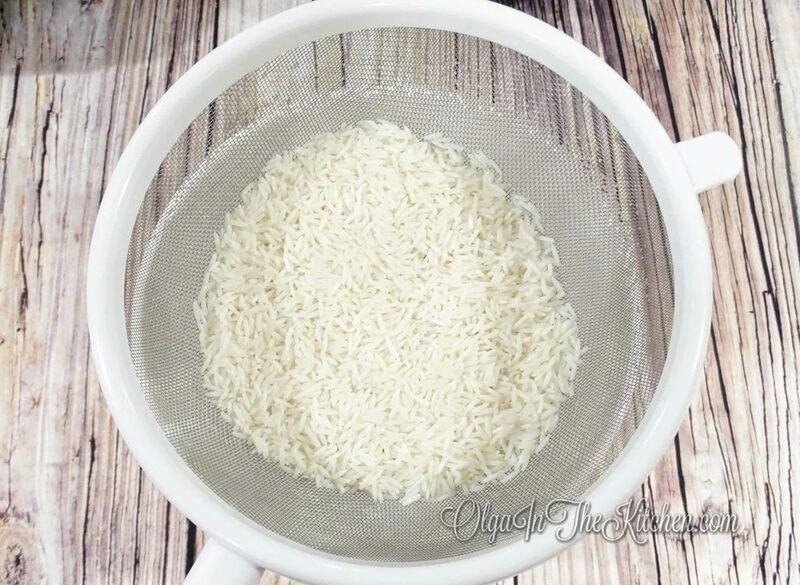 Start by putting 1 cup uncooked basmati rice in a sifter; rinse in cold water and leave it in a bowl with cold water; set aside. 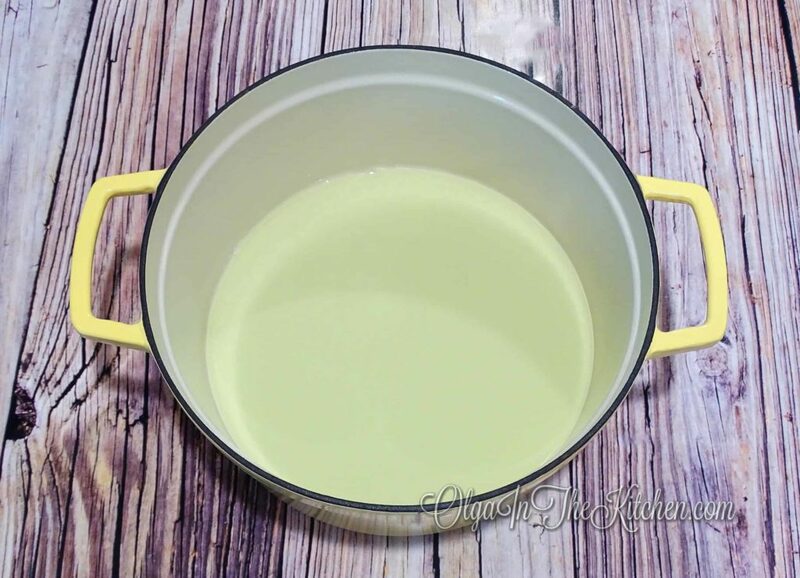 Preheat 2/3 cup grapeseed oil in a cast iron casserole on low-medium heat for about 5 minutes. 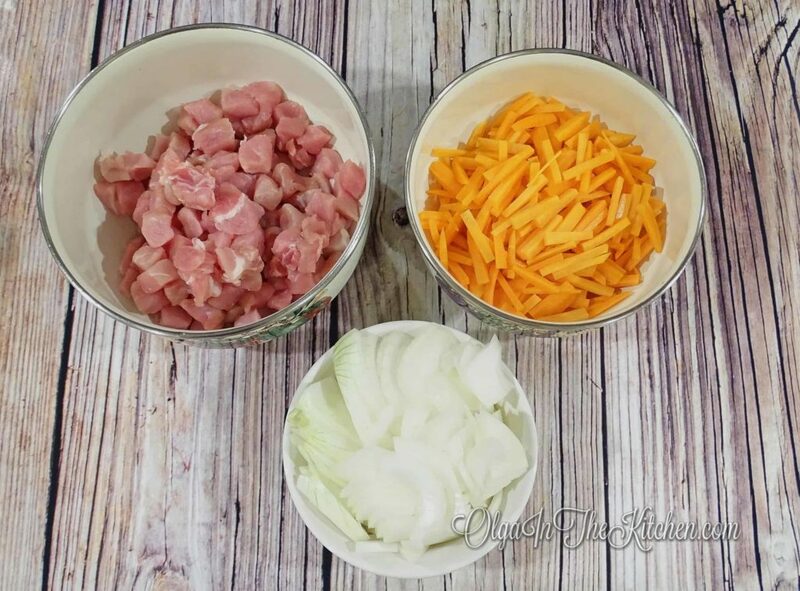 Meanwhile, prep and cut your main ingredients. Cube 1.5 lb pork meat into 1/2” pieces or smaller, chop carrots into matchsticks (about 1.5” long, 1/4” thickness), and chop 1 large onion into similar pieces to carrots. Add cubed meat pieces into heated oil, sauté for about 10-12 minutes, stir occasionally. 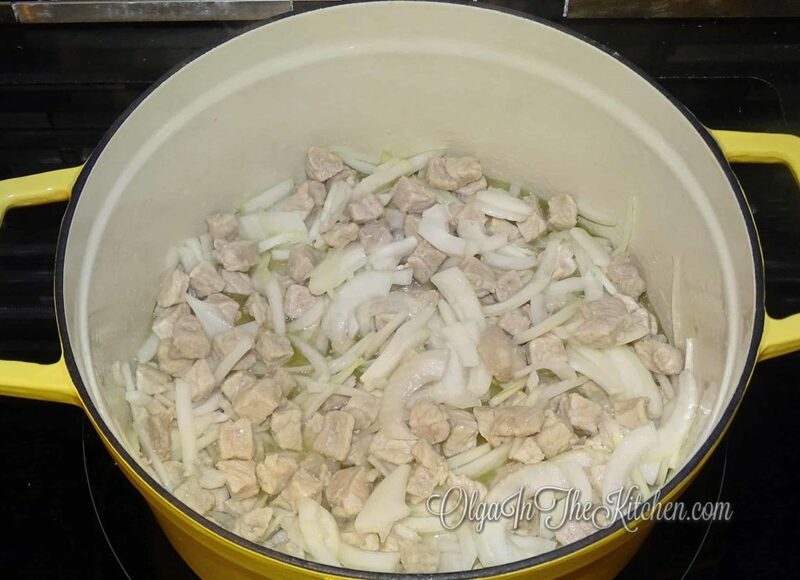 Add chopped onion to the meat, keep stirring occasionally for 10-12 minutes. 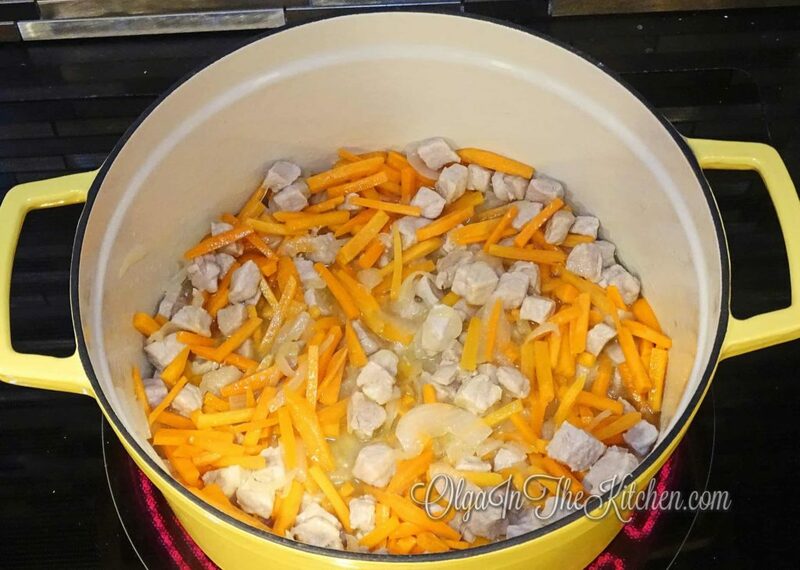 Add carrots matchsticks into casserole and keep sautéing for another 10-12 minutes. (Very important to stir occasionally to keep from scorching at the bottom). 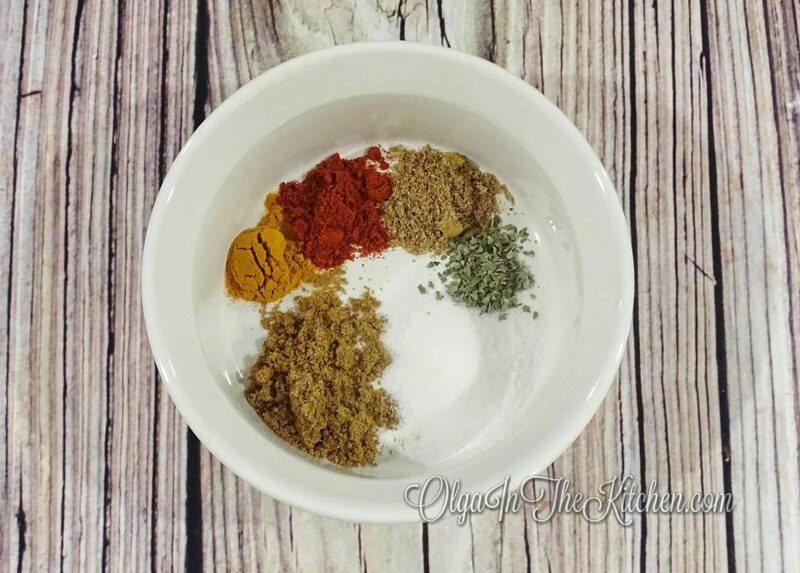 Meanwhile, measure herbs and spices: 1 1/2 tsp fine salt, 1 1/2 tsp ground cumin, 1/2 tsp ground turmeric, 1/2 tsp ground coriander, 1/2 tsp ground paprika, and 1/4 tsp dried paprika; whisk together and set aside. Sprinkle mixed herbs/spices over sautéed ingredients, add in 2 3/4 boiled water, and lightly stir. (I have my water boiler that keeps hot water 24/7, but if you don’t have that, I would suggest boiling water in separate pot to have it ready). 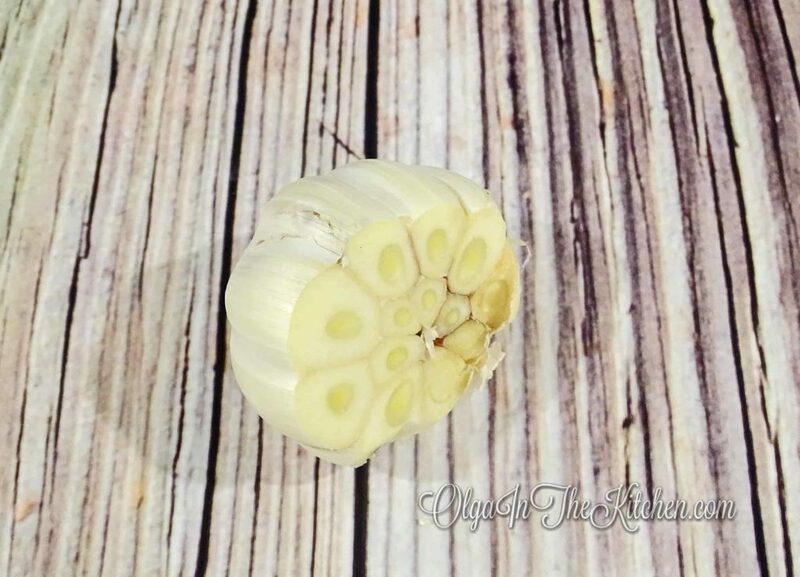 Cut off the head of the garlic to expose the cloves. 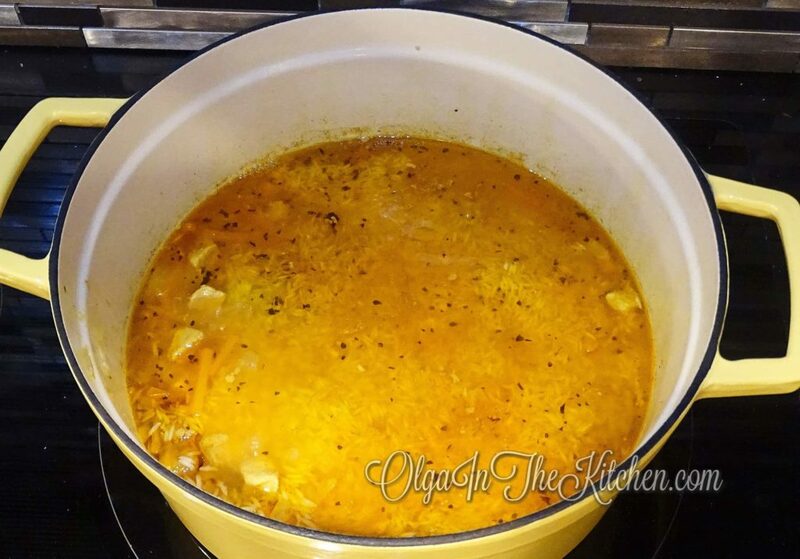 Put garlic cut side down into the center of the soup. You’re going to close the lid now, and keep it cooking for about 40 minutes on low; this is kind of a soup making process. (Make sure it boils a bit as I know every stove heating is different). Remove garlic, make sure you get all the cloves. 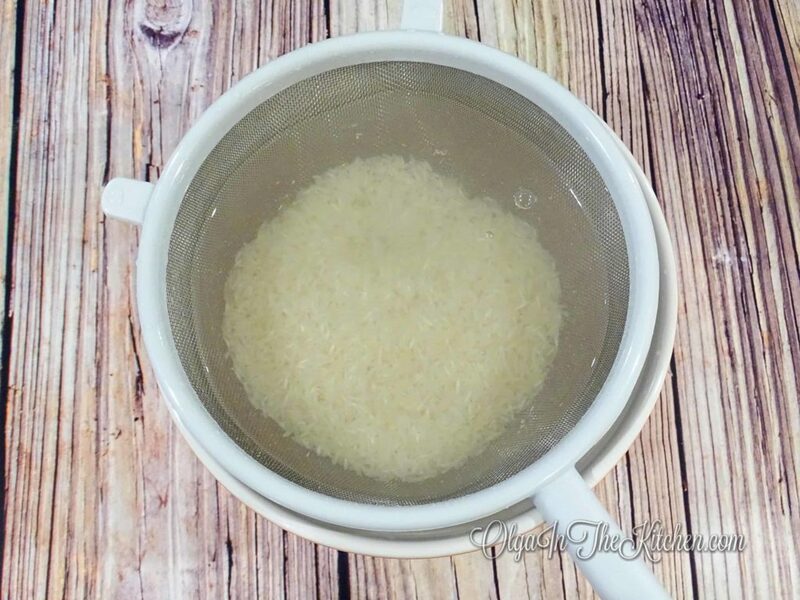 Rinse rice once more in cold water and spread on top in casserole. DON’T STIR IT, just spread on top to make sure all rice covered in the soup. Close the lid and turn up heat to low-medium (about 5). Saute for 15-17 minutes or until only about 3/4" liquid left on the bottom when you put a spatula through. 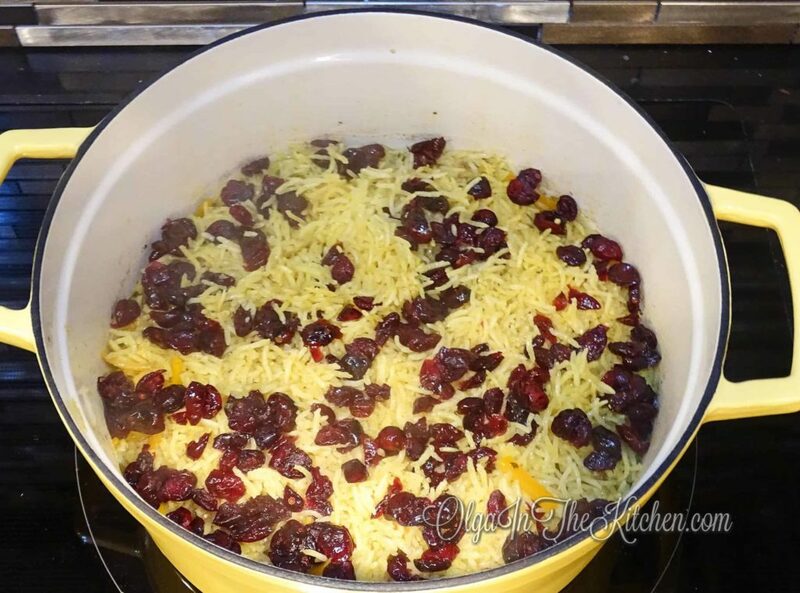 Sprinkle 1 cup dried cranberries over rice, and lightly push into rice, but don’t stir it. Close the lid back on, lower heat to low and let it saute for another 30-40 minutes until no liquid left. (Keep lid on the whole time so the steam stays in; you can check once-twice on the process). When finished, transfer cooked pilaf into a big pot or some metal big bowl. I would not suggest mixing in the casserole you cooked as there might be a bit scorching at the bottom (you don’t want that in your pilaf). Very gently mix everything with spatula. Try not to press or squeeze it. Store leftovers in refrigerator when cooled; heat on low the next day. But for now, serve while warm with tomatoes, cucumbers, pickles or any salad. Enjoy!!! I was searching for a great pilaf recipe and found yours. I have to admit, I don’t think I even loved pilaf so much until I tried your recipe. This is one scrumptious meal. I will be making it again! This is one delicious pilaf. I like how you mixed all the spices into this Ukrainian version. This went into my recipe book. Thank you! Thanks Nataliya, all my favorite spices! 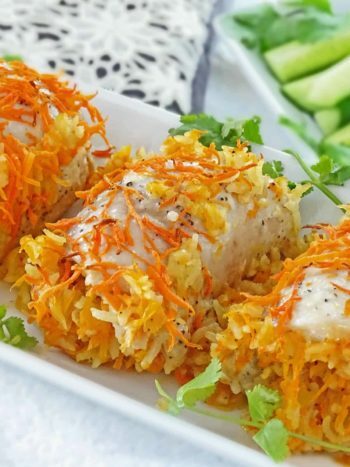 It’s a great dish! ? This is really good pilaf, I’ll be making it for Thanksgiving. Thank you! I tried many plov recipes and this was so far the best I tried in many years. Love the flavors and the cranberries in it. What a great recipe.